Greetings! It is a fabulous fall morning. I’d like to send out an invitation for you to come to my house! 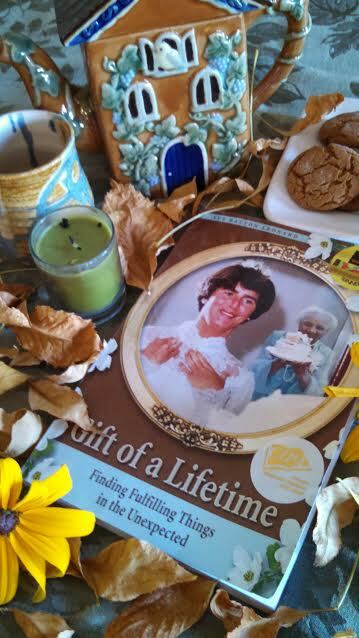 Enter through the doors of my childhood through my publication Gift of a Lifetime: Finding Fulfilling Things in the Unexpected. In my youth I was kept in stitches by a beautiful character named Fanny and my heart was sewn together too. Both were gifts that led me to live a fulfilling life. Through my memoir, I share a harvest of life lessons taught to me by my strong family. The teapot is filled in anticipation of your coming, there are homemade ginger snaps on the table and I hope you will enjoy the inspiring words of my beloved Fanny during this fine fall season. The real treasure lies in the voice in the EVVY award-winning audio book. But if you prefer the paperback or a digital download of an e-book, those are available too! Happy Harvest Everybody! Do return tomorrow and on Friday I want to tell you about an event that I just received an invitation to that will take me back to my childhood days. I am very excited.